Jersey’s south west coast includes a number of well-connected heathland sites. 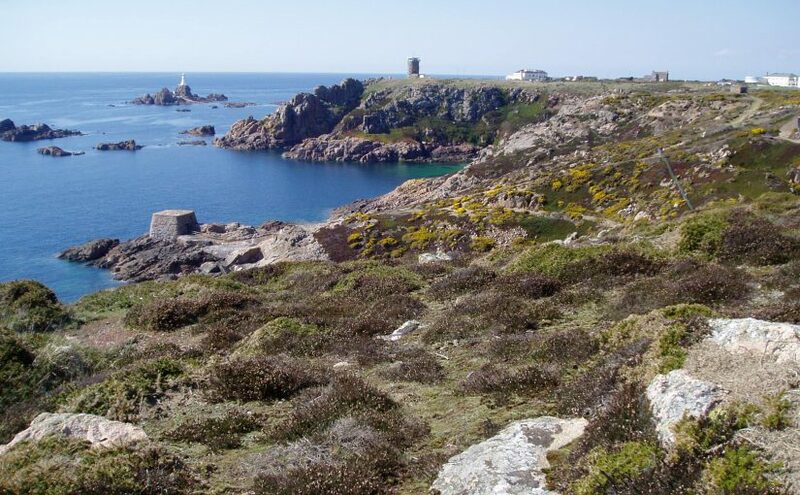 The long and narrow coastal site of La Lande du Ouest, or Gorselands, stretches from the prison, west towards Corbière lighthouse with large areas covered by heather, gorse and coastal grassland. Gorselands is very exposed to the Atlantic storms and gales and the dwarfed vegetation reflects this. On a windy day it ranks as one of the most exhilarating places in Jersey for a walk. The site, part of the Jersey National Park, is mostly held in trust. It was granted to the public of Jersey by Charles le Quesne. Biologically it’s important as it supports more than 116 species of plants. These in turn create the vegetation and habitats which support many kinds of animals. The coastline is rugged and the industrial past reveals itself in the form of camouflaged structures among the granite cliffs, once used for quarrying. Rose-coloured granite quarried from here was transported via the Railway Walk to the harbour and shipped to England to become part of the London Embankment. The lighthouse at La Corbière provides a magnificent backdrop to many of Gorselands’ views and was the first in the British Isles to be built of reinforced concrete. 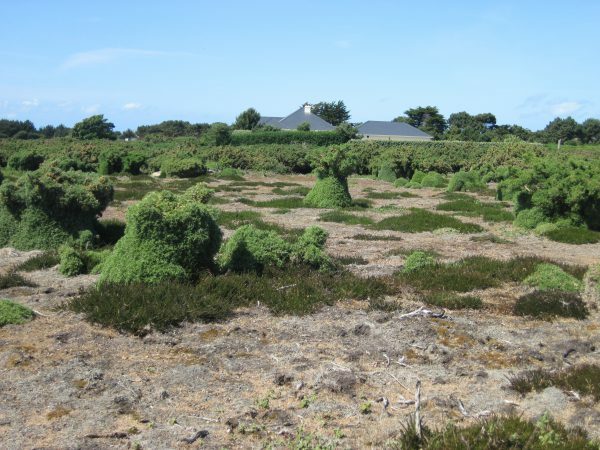 Atlantic Dry (Maritime) heathland has a limited distribution in Europe. Where it once occurred widely, it has now been reduced so much it has become a rare habitat across its range. This is just one of the criteria for which the site was designated as a Site of Special Interest (SSI) in 1996. As with other south coast heathland sites, Gorselands also provides an important link or corridor for wildlife to maintain current or create new populations. The warmth and glow that radiate from the granite on a summer’s evening help provide the conditions for animals and plants more usually associated with Mediterranean climates. Gorselands and the surrounding area has a very rich historical and archaeological heritage. There is a flint scatter site near La Corbière which dates human settlement of the area to at least 7,000 years ago. This coastal stretch was a major site for the local quarrying industry in the early part of the 20th century, and this industry has largely shaped the landscape we see today. There are many old quarries on site, resulting in steep inland cliffs, quarry pools and quarry spoil, all of which provide important habitats for many species. Old structures from this industry still stand, such as the stone crusher standing sentinel above the desalination plant, and the remains of old quarry cottages. Many German bunkers and other structures from the Island Occupation in WWII can also be found on site, some of which are looked after and maintained by the Channel Island Occupation Society and which open to the public on occasion. The work carried out at Gorselands to maintain the site’s scientific interest and appeal is varied, but dominated by the need to control invasive plant species. There are three main project areas which aim to improve the site’s biological health. Mesembryanthemums or iceplants are from South Africa and were first recorded in Jersey in 1868 in St Brelade’s Bay. Iceplants, which include the Hottentot fig, escaped from gardens into the wild. Without natural control by tortoises and baboons, and thanks to our south west coast oceanic climate, it’s spreading at a rate of 1.5m a year, smothering Jersey’s natural vegetation. Great progress is being made by Department of the Environment rangers, Jersey Probation and Community Service, Back to Work teams, Jersey Conservation Volunteers, corporate groups, schools and specialised rope access teams to control the fig, clearing it in large swathes from our cliffs and coastal slopes. Maintaining a varied heathland structure is very important to attract a wide variety of wildlife. This largely involves varying the age structure of the heather and gorse stands to create patches of pioneer grassland and more mature gorse and scrub, which is important for nesting birds. Without the historic grazing of livestock, the fern, bracken tends to become dominant on heathlands. Bracken is a native plant but it is actively managed to prevent it taking over priority habitats such as the Atlantic Dry (Maritime) heathland. 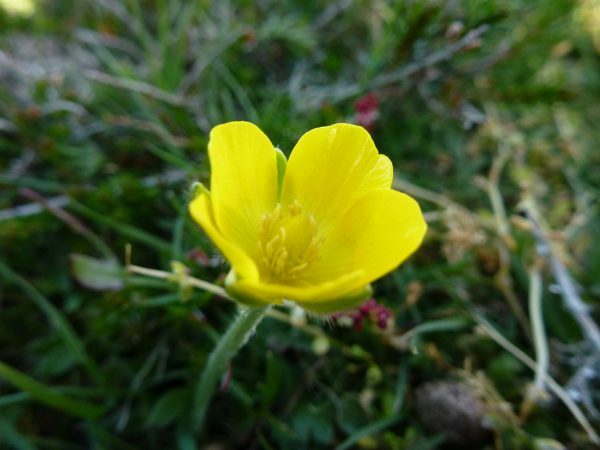 Gorselands supports some very unusual and uncommon plant species such as Shore Dock, which is a protected plant across Europe, Prostrate Wild Asparagus and the Jersey Buttercup. 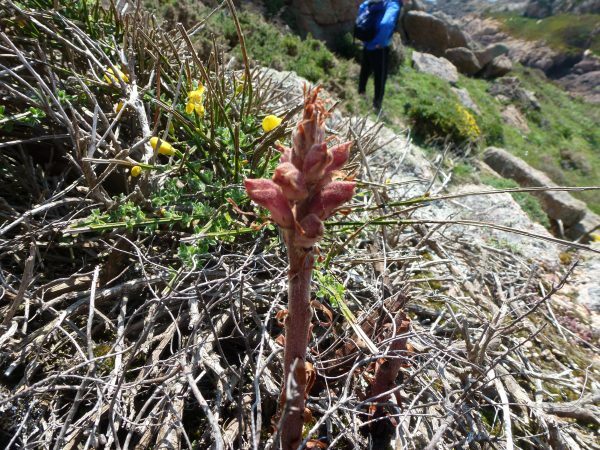 The Greater Broomrape, a parasitic plant which doesn’t harness its energy from the sun but rather steals it from nearby growing gorse is also found here. 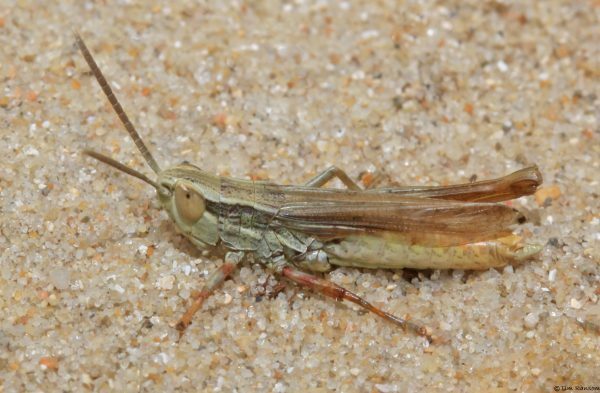 The site’s invertebrate records also suggest how diverse it is, and include Red Data Book species such as the Cornish Shieldbug, the ant Lasius emarginatus and the Blue Winged Grasshopper. Many interesting mosses and lichens are found on the short coastal grasslands including the rare lichen Umbilicaria grisea which within the British Isles is only found in Jersey. 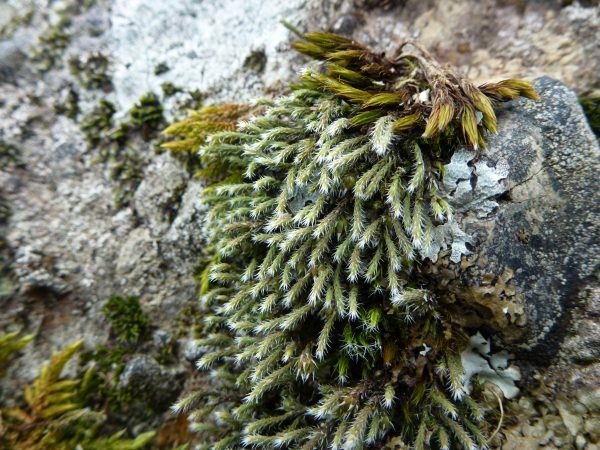 Also the beautiful but rare Starry Hoar-moss can be seen hanging from rock faces. 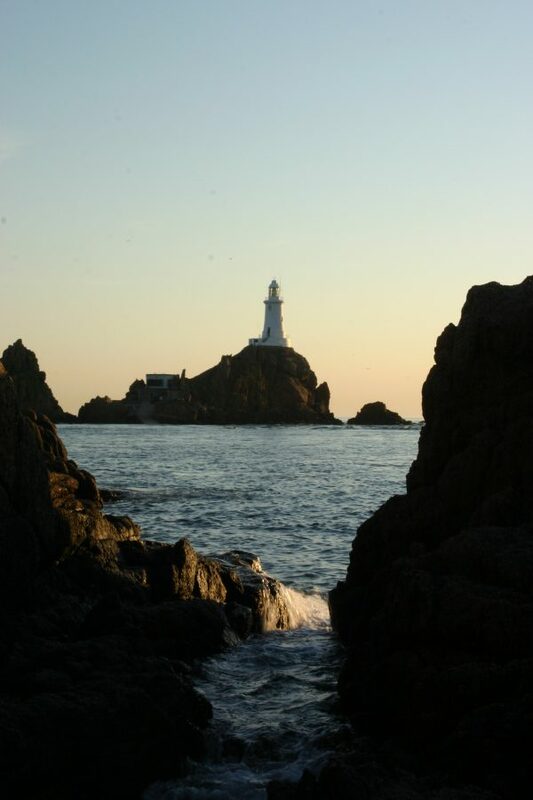 Bus routes 12, 12A and 22 provide a frequent service to La Corbière which is a good location to start your exploration. From here you have the options of walking east towards the meteorological radar station and returning on the Railway Walk or to continue past Beauport and St Brelade’s Bay to Portelet. You can find out more about walks in this area on Visit Jersey website. There are a couple of car parks with bicycle racks available on site and public toilets are located near to La Corbière. The next SSI focus article will be on La Lande de Est (Les Landes).